Everybody has had it…so why not you? The dreaded plantar fasciitis! 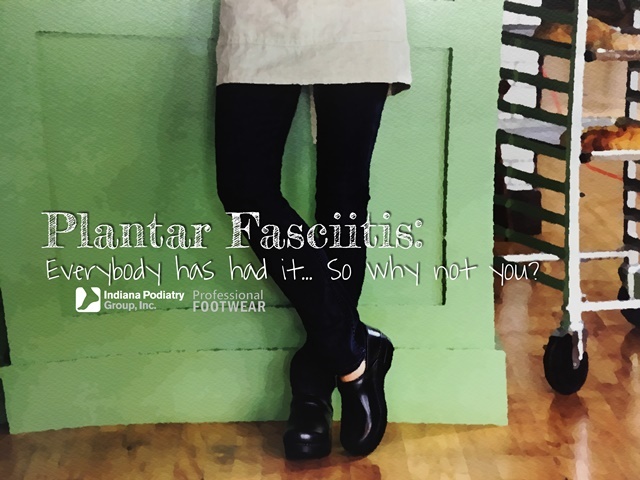 Yes, if you bring it up or tell your co-workers that you have heel pain there is no doubt someone will tell you about their plantar fasciitis. This is one of the most common conditions podiatrists treat and the most common cause of heel pain. Plantar fasciitis is considered an overuse injury where the plantar fascia gets small microscopic tears in it at the origin of where it attaches to the bone. When a patient sleeps or sits and rests the tissue contracts and tries to heal. As soon as the patient steps down the tissue “yanks” and causes more microscopic tears. This signals the body to send inflammation to the area and thus causes the pain. To resolve plantar fasciitis requires three things. Stretching of the Achilles tendon and plantar fascia, wearing supportive (not cushion) arch supports and good supportive shoes, as well as doing something to get rid of inflammation ranging from steroid injections, oral steroids, or non-steroidal anti-inflammatories. It also requires time as the body will take 6-8 weeks to heal the fascia. Seek treatment early as long-term scar tissue can start to build in the area and make it much more difficult to treat. If you are suffering from heal pain, call our experts at Indiana Podiatry Group.